The October Monthly Contest features Essie Holiday 2011, Luxeffects. 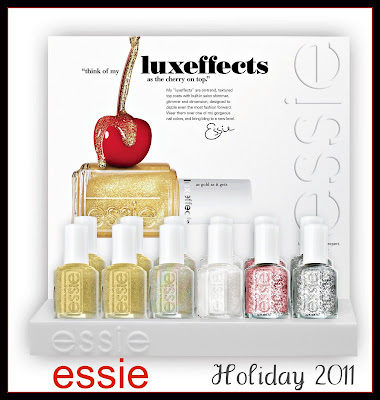 This is perhaps the Holiday collection that I am anticipating the most...six sparkly top coat colors, including a flakie! My understanding is that this collection may be available in just a couple of weeks at most, so as soon as I receive word that they've arrived, I'll close entries and draw a winner via Random.org. The Rules: If you'd like to enter for a chance to win the Essie Luxeffects Collection, simply send me an eMail (mej0620@hotmail.com) and use the word LUXE in the subject line of your eMail. Be sure to include your first name and last name (or at least your last name's initial) in the body of the eMail, and if you have a blog, include the link so I can share it with everyone should you win. Followers only, please. I can't wait to see some swatches of these! *flails* DEFINITELY my most anticipated collection for the holidays. I can't wait to see swatches! Thanks Mary. You have been having some amazing giveaways lately! I hope I win one!!! Ooh, i would LOVE to win this one! Wow!I love layering polishes!I will look forward to seeing swatches! Great giveaway! I am crossing my fingers right now. I hope I win!